We create, interpret, and experience stories every day, whether we realize it or not. Our brains are constantly receiving input and stringing things together in order for us to make sense of the world. While our brains create countless stories, only the few great ones stay with us. These make us cry, laugh, or embrace a new perspective. Understanding how our brains interpret the world can help us become better storytellers. That’s where neuroscience comes in. The field of neuroscience covers anything that studies the nervous system, from studies on molecules within nerve endings to data processing, to even complex social behaviors like economics. So let’s put our brains to the test. Take a look at this image for a few seconds. What do you see? We know very little about this scene. But because our brains crave structure, we still try to see the story. We take things we know—boxing gloves, children, and a corner man—and try to infer what the unknown might be. A good story takes us from the Known to the Unknown. This simple premise is the key to telling stories for the brain. Let’s apply this concept to a comic. Why a comic? Comics are similar to data stories in that they present a sequence of panes containing different data points that lead you through a story. Election year is coming up. Dying in Canada = real. What did we do in the course of reading the comic? We’re going to look at some basic brain anatomy to understand what our brain does when reading something like this. As you look at the comic, the prefrontal cortex in your frontal lobe kicks into gear, and your brain’s cognitive control goes to work. You're also processing data that comes into your brain as visual input. From your eyes, that data is sent to the primary visual cortex at the back of your brain and onward along two processing streams: the "what" and the "where" pathways. The "what" pathway (in purple) uses detailed visual information to identify what we see. It pieces together the lines and figures that add up to the comic's characters. It also recognizes the letters and words, and helps deciphers their meaning with the help of additional cortical regions like Wernicke's Area, a part of our language system. The "where" pathway (in green) processes where things are in space. We know this data stream is important and active during reading because adults with reading disabilities like dyslexia often have disrupted functioning of this pathway. So when we're interpreting visual information, we're activating quite a bit of our brains to make sense of the data we're presented. Things get more complex from there, because as we interpret the stories we see, even more brain areas become active. Part of the way we comprehend stories is through a simulation of what we see. So you can potentially activate parts of your brain involved in motor control or your sense of touch. And imagine if you connect emotionally to the story you're reading. You'll be activating areas of your brain involved in emotion (the limbic system). So when reading a good story, whether it's prose, a comic strip, a data-driven story, you have the potential to get almost global activation of your brain. And the most impactful and memorable stories are those that engage us most. Now that we know some of the anatomy, let’s look at the behavioral applications of what we know. Take a look at the figures and read them from left to right. Which one is not like the others? We can quickly see which figure is out of place. Our eyes jump right to it. How did we know which one was the oddball figure without anyone telling us what it looked like? We had already established a baseline that our initial figure was the normal figure. And when the outlier was presented, we knew right away that it didn't belong. This experiment is a common attentional process test called the oddball paradigm. A baseline is presented through repetition, then an oddball is presented. This should remind you of our Known-to-Unknown formula that I mentioned earlier. By creating a strong baseline, when the oddball—or an unexpected twist or climax—occurs, we are prepared for it and enjoy it. Our brain is processing the information based on our experience of the information input. Below is a figure of an ERP, or event-related potential. ERPs are averaged waveforms that measure electrical activity from your scalp. We can use them to measure reaction speed to attentional processing. In the left figure, we see our brains when presented with standard stimuli (each tick mark is 100ms). You see that we have relatively flat lines after the initial peak. The flat lines are expected because standard stimuli are essentially noise, and our mind zones out because it has been normalized. The figure on the right shows the oddball—or target—tone with a peak of 300ms (also known as a P300). This peak is from our brain detecting the oddball and concluding that this is the item to pay attention to. This peak is only possible through having established a clear baseline. The example above shows us we have to lay down a good foundation and logical progression to get to our peak. Without structure, our audience will experience our story as noise and tune out, like our figure on the left. When creating your own stories, remember that the brain craves structure and loves oddballs. The brain processes information by taking information it already knows to infer what a new piece of information might be. Therefore, making it easy as possible for the brain to understand the story is key to delivering a successful climax or twist. Now that you have some basic understanding of brain anatomy and neuroscience, try applying the lessons learned to your data stories. Create dashboards that engage the senses through pleasing designs, shapes, color, text, and interactivity. Embrace the oddball paradigm by clearly establishing a baseline before delivering your findings. That way, the audience’s mind will be primed to attend to it. And their brains will help them remember your story as one of the few good ones. The bagged trees algorithm is a commonly used classification method. By resampling our data and creating trees for the resampled data, we can get an aggregated vote of classification prediction. In this blog post I will demonstrate how bagged trees work visualizing each step. Conclusion: Other tree aggregation methods differ in how they grow trees and they may compute weighted average. But in the end we can visualize the result of a algorithm as borders between classified sets in a shape of connected perpendicular segments, as in this 2-dimensional case. As for higher dimensions these became multidimensional rectangular pieces of hyperplanes which are perpendicular to each other. Contributed by Bin Lin. He took NYC Data Science Academy 12 week full-time Data Science Bootcamp program between Jan 11th to Apr 1st, 2016. The post was based on his second class project(due at 4th week of the program). Explore food price changes over time from the year 1974 - 2015. Compare food price changes to All-Items price changes (All-items include all consumer goods and services, including food). Compare Consumer Food Price Changes vs. Producer Price Changes (producer price changes are the average change in prices paid to domestic producers for their output). Missing data: There are 2 missing values in the column of "Eggs"
Missing data: There are 25 missing values in the column of "Processed.fruits.vegetables". The high share of nonalcoholic beverages/soft drinks (6.7%) seems concerning as high consumption of soft drinks might pose the health risk. The Consumer Price Index (CPI) is a measure that examines average change over time in the prices paid by consumers for goods and services. It is calculated by taking price changes for each item in the predetermined basket of goods and averaging them; the goods are weighted according to their importance. Changes in CPI are used to assess price changes associated with the cost of living. As I was looking at the food price changes, I noticed that there was the dramatic increase during the late 70s. After reviewed history of the 1970s, a lot happened during that time of period, including the "Great Inflation". To view the food price changes for each category in a year, I created the bar chart in the Shinny app. Users can select a year from the slider; the chart will show food price changes of each category for that year. I actually created two bar charts side-by-side in case users want to compare the food price changes between any of the two years. A quick look at the year 2015, the price of "Egg" had the biggest increase; price of "Pork" dropped the most. In fact, many food categories dropped their price. Compared 2015, the year 2014 had fewer categories with dropped price; the price of "Beef and Veal" had the biggest increase. Food price changes mostly aligns with all-item price changes. Food price inflation has outpaced the economy-wide inflation in recent years. Based on United State Department of Agriculture (USDA), changes in farm-level and wholesale-level PPIs are of particular interest in forecasting food CPIs. Therefore, I created a chart to show the Over All Food Price Changes vs Producer Price Changes. Uses can choose one or more Producer food categories. From the chart, that food price changes mostly aligns with the producer price changes. However, farm level milk, farm level cattle, farm level wheat seem fluctuate since year 2000 and they didn't affect the over all food price change that much. Though the impact on the over all food price was small, I doubt they might have impacted individual food categories. I would like to add a new drop-down list to allow users to select food categories from the consumer food categories. To see the relationship among the different categories in terms of price changes, I created a correlation tile map. Looking ahead to 2016, ERS predicts food-at-home (supermarket) prices to rise 2.0 to 3.0 percent - a rate of inflation that remains in line with the 20-year historical average of 2.5 percent. For future works, I would love to try to fit a time-series model to predict the price changes for the coming five years. Again, this project was done in Shiny and most of the information in this blog post were from the Shiny, https://blin02.shinyapps.io/food_price_changes/. There are many ways to choose features with given data, and it is always a challenge to pick up the ones with which a particular algorithm will work better. Here I will consider data from monitoring performance of physical exercises with wearable accelerometers, for example, wrist bands. The data for this project come from this source: http://groupware.les.inf.puc-rio.br/har. In this project, researchers used data from accelerometers on the belt, forearm, arm, and dumbbell of few participants. They were asked to perform barbell lifts correctly, marked as "A", and incorrectly with four typical mistakes, marked as "B", "C", "D" and "E". The goal of the project is to predict the manner in which they did the exercise. There are 52 numeric variables and one classification variable, the outcome. We can plot density graphs for first 6 features, which are in effect smoothed out histograms. We can see that data behaviors are complicated. Some of features are bimodal and even multimodal. These properties could be caused by participants' different sizes or training levels or something else, but we do not have enough information to check it out. Nevertheless it is clear that our variables do not obey normal distribution. Therefore we are better with algorithms which do not assume normality, like trees and random forests. We can visualize the algorithms work in the following way: as finding vertical lines which divide areas under curves such that areas to the right and to to left of the line are significantly different for different outcomes. If there is a pair for a feature which satisfies it then the feature is chosen for a prediction. As result I got 21 features for a random forests algorithm. The last one yielded accuracy 99% for the model itself and on a validation set. I checked how many variables we need for the same accuracy with PCA preprocessing, and it was 36. Mind you that the variables will be scaled and rotated, and that we still use the same original 52 features to construct them. Thus more efforts are needed to construct a prediction and to explain it. While with the above method it is easier, since areas under curves represent numbers of observations. Contributed by Paul Greeh. Paul took NYC Data Science Academy 12 week full time Data Science Bootcamp program between Sept 23 to Dec 18, 2015. The post was based on his first class project(due at 2nd week of the program). Analyse fuel economy ratings in the automotive industry. Compare vehicle efficiency of American automotive manufacturer, Cadillac with the automotive industry as a whole. Compare vehicle efficiency of American automotive manufacturer, Cadillac, with self declared competition, the German luxury market. What further comparisons will display insight into EPA ratings? Import FuelEconomy.gov data and filter rows needed for analysis. Then remove all zero’s included in city and highway MPG data as this will skew results. - Replace this information with NA as to not perform calculations on data not present. Visualize city and highway EPA ratings of the entire automotive industry. How have EPA ratings for city and highway improved across the automotive industry as a whole? Note: No need to include combined as combined is simply a percentage based calculation defaulting to 60/40 but can be adjusted on the website. Data visualization shows relatively poor EPA ratings throughout the 1980's, 1990's and early to mid 2000's with the first drastic improvement in these ratings occurring around 2008. One significant event around this time period was the recession hitting America. Consumers having less disposable income along with increased oil prices likely fueled competition to develop fuel efficient powertrains across the automotive industry as a whole. Visualize Cadillac's city and highway EPA ratings with that of the automotive industry. How does Cadillac perform when compared to the automotive industry as a whole? Cadillac was chosen as a brand of interest because they are currently redefining their brand as a whole. It is important to analyze past performance to have a complete understanding of how Cadillac has been viewed for several decades. In 2002, Cadillac dropped to its lowest performance. Why did this occur? Because the entire fleet was made up of the same 4.6L V8 mated to a 4-speed automatic transmission, or as some would say... slush-box. The image that Cadillac had of this time was of a retirement vehicle to be shipped to its owners new retirement home in Florida with a soft ride, smooth powerful delivery and no performance. With the latest generation of Cadillac's being performance oriented beginning with the LS2 sourced CTS-V and now containing the ATS-V, CTS-V along with several other V-Sport models, a rebranding is crucial in order to appeal to a new market of buyers. Also interesting to note is that although there is an increased amount of performance models being produced, fuel efficiency is not lacking. The gap noted above has decreased although there has been an increase in performance models being developed, a concept not often found to align. How does Cadillac perform when compared with the German Luxury Market? “Mr. Ellinghaus, a German who came to Cadillac in January from pen maker Montblanc International after more than a decade at BMW, said he has spent the past 11 months doing”foundational work" to craft an overarching brand theme for Cadillac’s marketing, which he says relied too heavily on product-centric, me-too comparisons. Despite comments made by Mr. Ellinghaus, the end goal is for consumers to be comparing Cadillac with Audi, BMW and Mercedes-Benz. The fact that this is already happening is a huge success for the company which only ten years ago, would never be mentioned in the same sentence as the German Luxury market. Data visualization shows that Cadillac is equally rated as its German competitors and at the same time, has not had any significant dips unlike all other manufacturers. The continued increase in performance combined with rebranding signify that Cadillac is on a path to success. Every manufacturer has its strengths and weaknesses. It is important to assess and recognize these attributes to best determine where an increase in R&D spending is needed and where to maintain a competitive advantage for the consumer by vehicle class. In what vehicle class is Cadillac excelling or falling behind? The above data visualization displays the delta between Cadillac and the average (Audi, BMW, Mercedes-Benz) fuel economy ratings. Positive can then be considered above the average competition and negative, below the average competition. There is a lack of performance across all vehicle classes. Reasoning may be because the same power trains are being used across multiple chassis. There is a clear improvement in EPA ratings as federal emission standards drive innovation for increased fleet fuel economy. It is important for automotive manufacturers to continue innovation and push for increased efficiency. There's been many variations of this theme - defining big data with 3Vs (or more, including velocity, variety, volume, veracity, value), as well as other representations such as the data science alphabet. It was published in a scholarly paper entitled Computing in the Statistics Curricula (PDF document). Enjoy! Guest blog post by Martijn Theuwissen, co-founder at DataCamp. Other R resources can be found here, and R Source code for various problems can be found here. A data science cheat sheet can be found here, to get you started with many aspects of data science, including R.
Learning R can be tricky, especially if you have no programming experience or are more familiar working with point-and-click statistical software versus a real programming language. This learning path is mainly for novice R users that are just getting started but it will also cover some of the latest changes in the language that might appeal to more advanced R users. Creating this learning path was a continuous trade-off between being pragmatic and exhaustive. There are many excellent (free) resources on R out there, and unfortunately not all could be covered here. The material presented here is a mix of relevant documentation, online courses, books, and more that we believe is best to get you up to speed with R as fast as possible. Data Video produced with R: click here and also here for source code and to watch the video. More here. R is rapidly becoming the lingua franca of Data Science. Having its origins in academics, you will spot it today in an increasing number of business settings as well where it is a contestant to commercial software incumbents such as SAS, STATA and SPSS. Each year, R gains in popularity and in 2015 IEEE listed R in the top ten languages of 2015. This implies that the demand for individuals with R knowledge is growing, and consequently learning R is definitely a smart investment career wise (according to this survey R even is the highest paying skill). This growth is unlikely to plateau in the next years with large players such as Oracle &Microsoft stepping up by including R in its offerings. Nevertheless, money should not be the only driver when deciding to learn a new technology or programming language. Luckily, R has a lot more to offer than a solid paycheck. By engaging yourself with R, you will become familiar with a highly diverse and interesting community. Namely, R is being used for a diverse set of task such as finance, genomic analysis, real estate, paid advertising, and much more. All these fields are actively contributing to the development of R. You will encounter a diverse set of examples and applications on a daily basis, keeping things interesting and giving you the ability to apply your knowledge on a diverse range of problems. Before you can actually start working in R, you need to download a copy of it on your local computer. R is continuously evolving and different versions have been released since R was born in 1993 with (funny) names such as World-Famous Astronaut and Wooden Christmas-Tree. Installing R is pretty straightforward and there are binaries available for Linux, Mac and Windows from the Comprehensive R Archive Network (CRAN). Once R is installed, you should consider installing one of R’s integrated development environment as well (although you could also work with the basic R console if you prefer). Two fairly established IDE’s are RStudio and Architect. In case you prefer a graphical user interface, you should check out R-commander. DataCamp’s free introduction to R tutorial and the follow-up course Intermediate R programming. These courses teach you R programming and data science interactively, at your own pace, in the comfort of your browser. The swirl package, a package with offline interactive R coding exercises. There is also an online version available that requires no set-up. On edX you can take Introduction to R Programming by Microsoft. The R Programming course by Johns Hopkins on Coursera. R puts a big emphasis on documentation. The previously mentionedRdocumentation is a great website to look at the different documentation of different packages and functions. There are numerous blogs & posts on the web covering R such asKDnuggets and R-bloggers. One of the main reasons R is the favorite tool of data analysts and scientists is because of its data visualization capabilities. Tons of beautiful plots are created with R as shown by all the posts on FlowingData, such as this famous facebook visualization. If you want to get started with visualizations in R, take some time to study theggplot2 package. One of the (if not the) most famous packages in R for creating graphs and plots. ggplot2 is makes intensive use of the grammar of graphics, and as a result is very intuitive in usage (you’re continuously building part of your graphs so it’s a bit like playing with lego). There are tons of resources to get your started such as this interactive coding tutorial, a cheatsheet and an upcoming book by Hadley Wickham. If you want to see more packages for visualizations see the CRAN task view. In case you run into issues plotting your data this post might help as well. Next to the “traditional” graphs, R is able to handle and visualize spatial data as well. You can easily visualize spatial data and models on top of static maps from sources such as Google Maps and Open Street Maps with a package such as ggmap. Another great package is choroplethr developed by Ari Lamstein of Trulia or the tmap package. 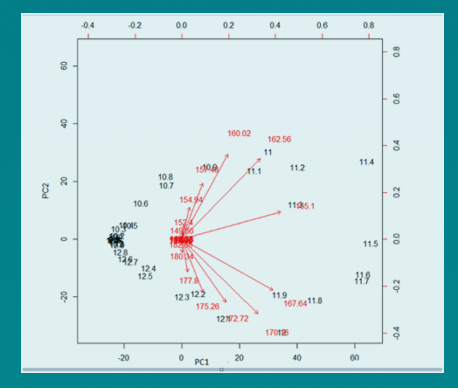 Take this tutorial onIntroduction to visualising spatial data in R if you want to learn more. Note that these resources are aimed at beginners. If you want to go more advanced you can look at the multiple resources there are for machine learning with R. Books such as Mastering Machine Learning with R andMachine Learning with R explain the different concepts very well, and online resources like the Kaggle Machine Learning course help you practice the different concepts. Furthermore there are some very interesting blogs to kickstart your ML knowledge like Machine Learning Mastery or this post. One of the best way to share your models, visualizations, etc is through dynamic documents. R Markdown (based on knitr and pandoc) is a great tool for reporting your data analysis in a reproducible manner though html, word, pdf, ioslides, etc. This 4 hour tutorial on Reporting with R Markdownexplains the basics of R markdown. Once you are creating your own markdown documents, make sure this cheat sheet is on your desk. HTML widgets allow you to create interactive web visualizations such as dynamic maps (leaflet), time-series data charting (dygraphs), and interactive tables (DataTables). If you want to learn how to create your own watch this tutorial by RStudio. Another technology making a lot of noise recently is Shiny. With Shiny you can make your own interactive web applications in R such as these. There is a whole learning portal dedicated to building your own Shiny applications. Lately, there is a lot of focus on how to run R in the cloud. If you want to do this yourself, you can have a look at tutorials such as running R on AWS, the R programming language for Azure, and RStudio Server on Digital Ocean. Once you have some experience with R, a great way to level up your R skillset is the free book Advanced R by Hadley Wickham. In addition, you can start practicing your R skills by competing with fellow Data Science Enthusiasts on Kaggle, an online platform for data-mining and predictive modelling competitions. Here you have the opportunity to work on fun cases such as this titanic data set. To end, you are now probably ready to start contributing to R yourself by writing your own packages. Enjoy! About this book: Numerical computation, knowledge discovery and statistical data analysis integrated with powerful 2D and 3D graphics for visualization are the key topics of this book. The Python code examples powered by the Java platform can easily be transformed to other programming languages, such as Java, Groovy, Ruby and BeanShell. This book equips the reader with a computational platform which, unlike other statistical programs, is not limited by a single programming language. This is a guest repost by Jacob Joseph. An Outlier is an observation or point that is distant from other observations/points. But, how would you quantify the distance of an observation from other observations to qualify it as an outlier. Outliers are also referred to as observations whose probability to occur is low. But, again, what constitutes low?? There are parametric methods and non-parametric methods that are employed to identify outliers. Parametric methods involve assumption of some underlying distribution such as normal distribution whereas there is no such requirement with non-parametric approach. Additionally, you could do a univariate analysis by studying a single variable at a time or multivariate analysis where you would study more than one variable at the same time to identify outliers. The question arises which approach and which analysis is the right answer??? Unfortunately, there is no single right answer. It depends for what is the end purpose for identifying such outliers. You may want to analyze the variable in isolation or maybe use it among a set of variables to build a predictive model. Let’s try to identify outliers visually. How can we identify outliers in the Revenue? We shall try to detect outliers using parametric as well as non-parametric approach. The x-axis, in the above plot, represents the Revenues and the y-axis, probability density of the observed Revenue value. The density curve for the actual data is shaded in ‘pink’, the normal distribution is shaded in 'green' and log normal distribution is shaded in 'blue'. The probability density for the actual distribution is calculated from the observed data, whereas for both normal and log-normal distribution is computed based on the observed mean and standard deviation of the Revenues. Outliers could be identified by calculating the probability of the occurrence of an observation or calculating how far the observation is from the mean. For example, observations greater/lesser than 3 times the standard deviation from the mean, in case of normal distribution, could be classified as outliers. The above plots show the shift in location or the spread of the density curve based on an assumed change in mean or standard deviation of the underlying distribution. It is evident that a shift in the parameters of a distribution is likely to influence the identification of outliers. Let’s look at a simple non-parametric approach like a box plot to identify the outliers. In the box plot shown above, we can identify 7 observations, which could be classified as potential outliers, marked in green. These observations are beyond the whiskers. In the data, we have also been provided information on the OS. Would we identify the same outliers, if we plot the Revenue based on OS?? In the above box plot, we are doing a bivariate analysis, taking 2 variables at a time which is a special case of multivariate analysis. It seems that there are 3 outlier candidates for iOS whereas there are none for Android. This was due to the difference in distribution of Revenues for Android and iOS users. So, just analyzing Revenue variable on its own i.e univariate analysis, we were able to identify 7 outlier candidates which dropped to 3 candidates when a bivariate analysis was performed. Both Parametric as well as Non-Parametric approach could be used to identify outliers based on the characteristics of the underlying distribution. If the mean accurately represents the center of the distribution and the data set is large enough, parametric approach could be used whereas if the median represents the center of the distribution, non-parametric approach to identify outliers is suitable. Dealing with outliers in a multivariate scenario becomes all the more tedious. Clustering, a popular data mining technique and a non-parametric method could be used to identify outliers in such a case. One of the most important tasks in Machine Learning are the Classification tasks (a.k.a. supervised machine learning). Classification is used to make an accurate prediction of the class of entries in the test set (a dataset of which the entries have not been labelled yet) with the model which was constructed from a training set. You could think of classifying crime in the field of Pre-Policing, classifying patients in the Health sector, classifying houses in the Real-Estate sector. 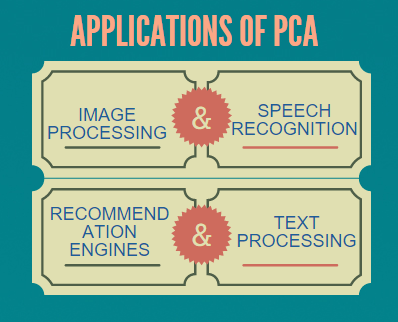 Another field in which classification is big, is Natural Lanuage Processing (NLP). This is the field of science with the goal to makes machines (computers) understand (written) human language. You could think of Text Categorization, Sentiment Analysis, Spam detection and Topic Categorization. For classification tasks there are three widely used algorithms; the Naive Bayes, Logistic Regression / Maximum Entropy and Support Vector Machines. We have already seen how the Naive Bayes works in the context of Sentiment Analysis. Although it is more accurate than a bag-of-words model, it has the assumption of conditional independence of its features. 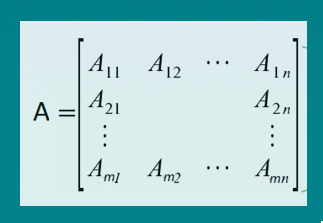 This is a simplification which makes the NB classifier easy to implement, but it is also unrealistic in most cases and leads to a lower accuracy. A direct improvement on the N.B. classifier, is an algorithm which does not assume conditional independence but tries to estimate the weight vectors (feature values) directly. This algorithm is called Maximum Entropy in the field of NLP and Logistic Regression in the field of Statistics. Maximum Entropy might sounds like a difficult concept, but actually it is not. It is a simple idea, which can be implemented with a few lines of code. But to fully understand it, we must first go into the basics of Regression and Logistic Regression. 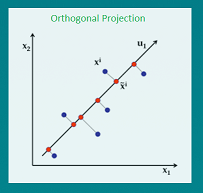 Regression Analysis is the field of mathematics where the goal is to find a function which best correlates with a dataset. Lets say we have a dataset containing datapoints; . For each of these (input) datapoints there is a corresponding (output) -value. Here the -datapoints are called the independent variables and the dependent variable; the value of depends on the value of , while the value of may be freely chosen without any restriction imposed on it by any other variable. 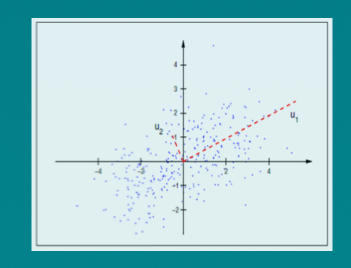 The goal of Regression analysis is to find a function which can best describe the correlation between and . In the field of Machine Learning, this function is called the hypothesis function and is denoted as . If we can find such a function, we can say we have successfully build a Regression model. If the input-data lives in a 2D-space, this boils down to finding a curve which fits through the datapoints. In the 3D case we have to find a plane and in higher dimensions a hyperplane. If the results looks like the figure on the left, then we are out of luck. It looks like the points are distributed randomly and there is not correlation between and at all. However, if it looks like the figure on the right, there is probably a strong correlation and we can start looking for the function which describes this correlation. where are the dependent parameters of our model. Evaluating the results from the previous section, we may find the results unsatisfying; the function does not correlate with the datapoints strong enough. Our initial assumption is probably not complete. Taking only the studying time into account is not enough. The final grade does not only depend on the studying time, but also on how much the students have slept the night before the exam. Now the dataset contains an additional variable which represents the sleeping time. Our dataset is then given by . In this dataset indicates how many hours student has studied and indicates how many hours he has slept. See the rest of the blog here, including Linear vs Non-linear, Gradient Descent, Logistic Regression, and Text Classification and Sentiment Analysis. I wrote a blog post inspired by Jamie Goode's book "Wine Science: The Application of Science in Winemaking". In this book, Goode argued that reductionistic approach cannot explain relationship between chemical ingredients and taste of wine. Indeed, we know not all high (alcohol) wines are excellent, although in general high wines are believed to be good. Usually taste of wine is affected by a complicated balance of many components such as sweetness, acid, tannin, density or others that are given by corresponding chemical entities. However, I think (and probably many other data science experts agree) that it is not a limitation of reductionistic approach, but a limitation of univariate modeling. 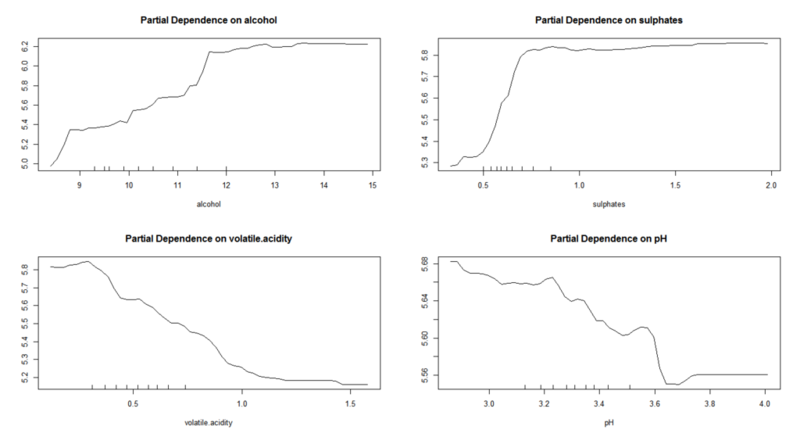 To illustrate it, I performed a series of multivariate modeling with random forest or other models on "Wine Quality" dataset of UCI Machine Learning repository. As a result, a random forest classifier predicted tasting score of wine better than intuitive univariate modeling. At the same time, it also showed some hidden and complicated dynamics between chemical ingredients and taste of wine. I believe that modern multivariate modeling such as machine learning can reveal more complicated relationship between chemical ingredients and taste of wine. See my blog post below for more details. 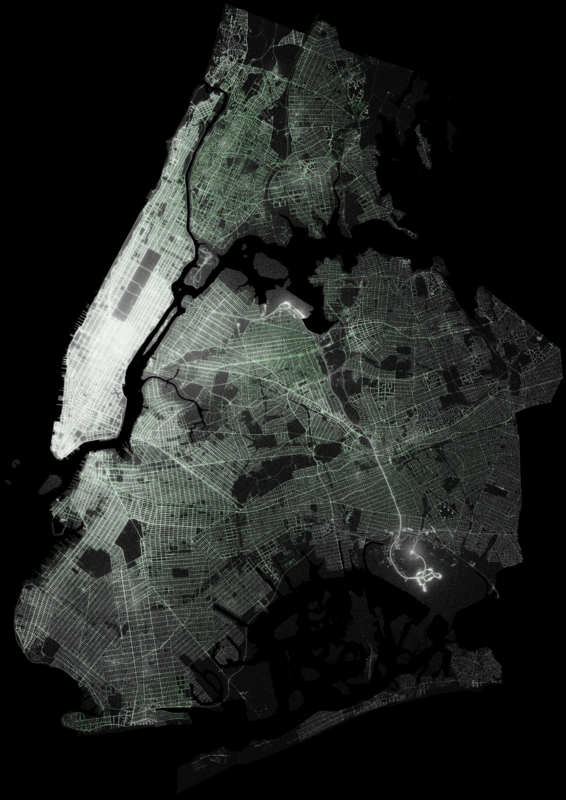 An open-source exploration of the city's neighborhoods, nightlife, airport traffic, and more, through the lens of publicly available taxi and Uber data. Images are clickable to open hi-res versions. Original post covers a lot more details and for those who want to pursue more analysis on their own: everything in the post - the data, software, and code - is freely available. Full instructions to download and analyze the data for yourself are available on GitHub. For today’s post we use crimtab dataset available in R. Data of 3000 male criminals over 20 years old undergoing their sentences in the chief prisons of England and Wales. The 42 row names ("9.4", 9.5" ...) correspond to midpoints of intervals of finger lengths whereas the 22 column names ("142.24", "144.78"...) correspond to (body) heights of 3000 criminals, see also below. "142.24" "144.78" "147.32" "149.86" "152.4" "154.94" "157.48" "160.02" "162.56" "165.1" "167.64" "170.18" "172.72" "175.26" "177.8" "180.34"
 "182.88" "185.42" "187.96" "190.5" "193.04" "195.58"
Note: the resultant components of pca object from the above code corresponds to the standard deviations and Rotation. From the above standard deviations we can observe that the 1st PCA explained most of the variation, followed by other pcas’. Rotation contains the principal component loadings matrix values which explains /proportion of each variable along each principal component. In the second principal component, PC2 places more weight on 160.02, 162.56 than the 3 features, "165.1, 167.64, and 170.18" which are less correlated with them. Following the Mediator scandal, France adopted in 2011 a Sunshine Act. For the first time we have data on the presents and contracts awarded to health care professionals by pharmaceutical companies. Can we use graph visualization to understand these dangerous ties? Pharmaceutical companies in France and in other countries use presents and contracts to influence the prescriptions of health care professionals. This has posed ethical problems in the past. In France, 21 persons are currently prosecuted for their role in the Mediator scandal, a drug that was recently banned. Some of them are accused of having helped the drug manufacturer obtain an authorization to sell its drug and later fight its ban in exchange for money. In the US, GlaxoSmithKline was condemned to pay $3 billion in the largest health-care fraud settlement in US history. Before the settlement, GlaxoSmithKline paid various experts to fraudulently market the benefits of its drugs. Such problems arose in part because of a lack of transparency in the ties between pharmaceutical companies and health-care professionals. With open data now available can we change this? Regards Citoyens, a French NGO, parsed various sources to build the first database documenting the financial relationships between health care providers and pharmaceutical manufacturers. That database covers a period from January 2012 to June 2014. It contains 495 951 health care professionals (doctors, dentists, nurses, midwives, pharmacists) and 894 pharmaceutical companies. The contracts and presents represent a total of 244 572 645 €. The original data can be found on the Regards Citoyens website. The data is stored in one large CSV file. We are going to use graph visualization to understand the network formed by the financial relationships between pharmaceutical companies and health care professionals. Now the data is stored in Neo4j as a graph (download it here). It can be searched, explored and visualized through Linkurious. Unfortunately, names in the data have been anonymized by Regards Citoyens following pressure from the CNIL (the French Commission nationale de l’informatique et des libertés). Who is Sanofi giving money to? Let’s start our data exploration with Sanofi, the French biggest pharmaceutical company. If we search Sanofi through Linkurious we can see that it is connected to 57 765 professionals. Let’s focus on the 20 Sanofi’s contacts who have the most connections. 19 doctors among Sanofi’s top 20 connections. In a click, we can filter the visualization to focus on the doctors. We are now going to color them according to their region of origin. Region of origin of Sanofi’s 19 doctors. Indirectly, the health care professionals Sanofi connects to via presents also tell us about its competitors. Let’s look at who else has given presents to the health care professionals befriended by Sanofi. Sanofi’s contacts (highlighted in red) are also in touch with other pharmaceutical companies. Zooming in, we can see Sanofi is at the center of a very dense network next to Bristol-Myers Quibb, Pierre Gabre, Lilly or Astrazeneca for example. According to the Sunshine dataset, Sanofi’s is competing with these companies. We can also see an interesting node. It is a student who has received presents from 104 pharmaceutical companies including companies that are not direct competitors of Sanofi. Why has he received so much attention? Unfortunately all we have is an ID (02b0d3726458ef46682389f2ac7dc7af). Sanofi could identify the professionals its competitors have targeted and perhaps target them too in the future. Who has received the most money from pharmaceutical companies in France? Neo4j includes a graph query language called Cypher. Through Cypher we can compute complex graph queries and get results in seconds. The doctor behind the ID 2d92eb1e795f7f538556c59e48aaa7c1 has received 77 480€ from 6 pharmaceutical companies. The relationships are colored according to the money they represent. St Jude Medical has over 70 231€ to Dr 2d92eb1e795f7f538556c59e48aaa7c1. Perhaps next time they receive a prescription from Dr 2d92eb1e795f7f538556c59e48aaa7c1, his patients would like to know about his relationship with St Jude Medical. Unfortunately today the Sunshine data is anonymous. We can also find the most generous pharmaceutical company. Novartis Pharma has awarded 12 595 760€ to various entities. The 5 entities receiving the most money from Novartis. When we look closer, we can see that the 5 entities which have received the most money from Novartis Pharma are 5 NGOs. 24f3287da6ab125862249416bc91f9c4 has received 75 000€. Come meet us at GraphConnect in London, the biggest graph event in Europe. It is sponsored by Linkurious and you can use “Linkurious30″ to register and get a 30%discount! The Sunshine dataset offers a rare glimpse into the practice of pharmaceutical companies and how they use money to influence the behavior of health care professionals. Unfortunately for citizens looking for transparency, the data is anonymized. Perhaps it will change in the future? K Clique Percolation - A clique merging algorithm. Given a set kk, the algorithm goes on to produce kk clique clusters and merge them (percolate) as necessary. DP Clustering - seed growth approach to finding dense subgraphs similar to MCODE but has an internal representation of weights in the edges, and the stopiing condition is different. IPCA - Modified DPClus Algorithm which focuses on maintaining the diameter of a cluster (defined as the maximum shortest distance between all pairs of vertices, rather than its density. CoAch - Combined Approach with finding a small number of cliques as complexes first and then growing them. In the original article, these visualizations are interactive, and you will find out which software was used to produce them. For my submission to HackCambridge I wanted to spend my 24 hours learning something new in accordance with my interests. I was recently introduced to protein interaction networks in my Bioinfomartics class, and during my review of machine learning techniques for an exam noticed that we study many supervised methods, but no unsupervised methods other than the k means clustering. Thus I decided to combine the two interests by clustering the Protein interaction networks with unsupervised clustering techniques and communicate my learning, results, and visualisations using the Beaker notebook. The study of protein-protein interactions (PPIs) determined by high-throughput experimental techniques has created karge sets of interaction data and a new need for methods allowing us to discover new information about biological function. These interactions can be thought of as a large-scale network, with nodes representing proteins and edges signifying an interaction between two proteins. In a PPI network, we can potentially find protein complexes or functional modules as densely connected subgraphs. A protein complex is a group of proteins that interact with each other at the same time and place creating a quaternary structure. Functional modules are composed of proteins that bind each other at different times and places and are involved in the same cellular process. Various graph clustering algorithms have been applied to PPI networks to detect protein complexes or functional modules, including several designed specifically for PPI network analysis. A select few of the most famous and recent topographical clustering algorithms were implemented based on descriptions from papers, and applied to PPI networks. Upon completion it was recognized that it is possible to apply these to other interaction networks like friend groups on social networks, site maps, or transportation networks to name a few. This post brings forth to the audience, few glimpses (strictly) of insights that were obtained from a case of how predictive analytic's helped a fortune 1000 client to unlock the value in their huge log files of the IT Support system. Going to quick background, a large organization was interested in value added insights (actionable ones) from thousands of records logged in the past, as they saw both expense increase at no higher productivity. As, most of us know in these business scenarios end-users will be much interested in out-of-knowledge, strange and unusual things that may not be captured from regular reports. Hence, here data scientist job not only ends at finding un-routine insights, but, also needs to do a deeper dig for its root cause and suggest best possible actions for immediate remedy (knowledge of domain or other best practices in industry will help a lot). Further, as mentioned earlier, only few of those has been shown/discussed here and all the analysis has been carried out using R Programming Language components viz., R-3.2.2, RStudio (favorite IDE), ggplot2 package for plotting. The first graph (below one) is a time series calendar heat map adopted from Paul Bleicher, shows us the number of tickets raised day-wise over every week of each month for the last year (green and its light shades represent less numbers, where as red and its shades represent higher numbers). Herein, if one carefully observe the above graph, it will be very evident for us that, except for the month of April &amp; December, all other months have sudden increase in the number of tickets raised over last Saturday's and Sunday's; and this was more clearly visible at Quarter ends of March, June, September (also at November which is not a Quarter end). One can think of this as unusual behavior as numbers raising at non-working days. Before, going into further details, lets also look at one more graph (below), which depicts solved duration in minutes on x-axis and their respective time taken through a horizontal time line plot. 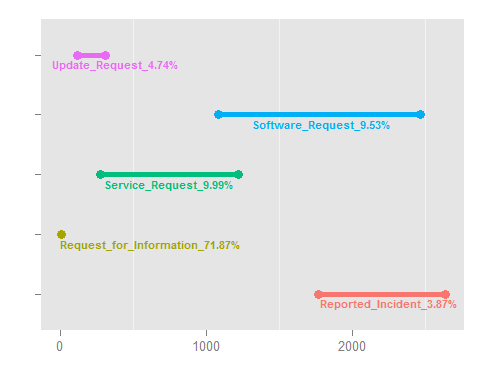 The above solved duration plot show us that out of all records analyzed 71.87% belong to "Request for Information" category and they have been solved within few minutes of tickets raised (that's why we cannot see a line plot for this category as compared to others). So, what's happened here actually was a kind of spoof, because of lack of automation in their systems. In simple words, it was found that there doesn't exists a proper documentation/guidance for many of applications they were using; such situation was taken as advantage for increasing the number of tickets (i.e. nothing but, pushing for more tickets even for basic information in the month ends and quarter ends, which resulted in month end openings which in turn forced them to close immediately). Discussed one here is one of those among many which has been presented with possible immediate remedies which can be easily actionable. I have spent many hours planning and executing in-company self-service BI implementation. This enabled me to gain several insights. Now that the ideas became mature enough and field-proven, I believe they are worth sharing. No matter how far you are in toying with potential approaches (possibly you are already in the thick of it! ), I hope my attempt of describing feasible scenarios would provide a decent foundation. All scenarios presume that IT plays its main role by owning the infrastructure, managing scalability, data security, and governance. I tried to elaborate every aspect of possible solution leaving behind all marketing claims of the vendor. Scenario 1. Tableau Desktop + departmental/cross-functional data schemas. This scenario involves gaining insights by data analysts on a daily basis. They might be either independent individuals or a team. Business users’ interaction with published workbooks is applicable, but limited to simple filtering. Fast response for complex ad-hoc business problems. Most likely involves Tableau training on query performance optimisation on a particular data source (e.g. Vertica). Create a “sandbox” that allows data analysts to query and collaborate on their own and without supervision. Further promotion of workbooks to production is welcome. Scenario 2. Tableau Desktop + custom data marts. In this scenario, business users are fully in charge of data analysis. IT provides custom data marts. Licenses: Tableau Desktop + Server Interactors. Self-publishing for further ad-hoc access across multiple devices. Deliver training in 2-3 wisely structured sections with 2-3 week breaks for business users to have time for playing with software, along with generating needs for the new skills. Focus on reach visualisations, not tables. This scenario fully relies on data models published by data analysts and powerful Web Edit features of Tableau Server. Could serve as a foundation for self-service BI adoption among C-Suite. Any changes in the data model require development and republishing of a template. Provide as much ad-hoc assistance as you can. In my next post, I would like to throw light on some technical aspects and limitations of each scenario. I highly appreciate any comments and looking forward to know about your experience. possible - for the first time ever - to store Petabytes of data on commodity hardware and process this data, as needed, in a fault tolerant and incredibly quick fashion. Many of us fail to understand the full implications of this inflection point in the history of computing. Storage is decreasing in cost every year, to the point where you can now have multiple GB on a USB drive that 10 years ago you could only store a few MBs. Gigabit internet is being installed in cities all over the world. Spark uses the concept of in memory distributed computation to perform at 10X map reduce for gigantic datasets and is already being used in production by Fortune 50 companies. Tableau, Qlik, MicroStrategy, Domo, etc. have gained tremendous market share as companies that have implemented Hadoop components such as HDFS, Hbase, Hive, Pig, and Map Reduce are starting to wonder "How I can I visualize that data?" Now think about VR - probably the hottest field in technology at this moment. It has been more than a year since Facebook bought Oculus for 2Billion and we have seen Google Cardboard burst onto the scene. Applications from media companies like the NY Times are already becoming part of our every day lives. This month at the CES show in Las Vegas, dozens of companies were showcasing virtual reality platforms that improve on the state of the art and allow for a motion-sickness free immersive experience. All of this combines into my primary hypothesis - this is a great time to start a company that would provide the capability for immersive data visualization environments to businesses and consumers. I personally believe that businesses and government agencies would be the first to fully engage in this space on the data side, but there is clearly an opportunity in gaming on the consumer side. Personally, I have been so taken by the potential of this idea that I wrote a post in this blog about the “feeling” of being in one of these immersive VR worlds. The post describes what it would be like to experience data with not only vision, but touch and sound and even smell. Just think about the possibilities of examining streaming data sets, that currently are being analyzed with tools such as Storm, Kafka, Flink, and Spark Streaming as a river flowing under you! The strength of the water can describe the speed of the data intake, or any other variable that is represented by a flow - stock market prices come to mind. The possibilities for immersive data experiences are absolutely astonishing. The CalTech astronomers have already taken the first step in that direction, and perhaps there is a company out there that is already taking the next step. That being said, if this sounds like an exciting venture to you, DM me on twitter @Namenode5 and we can talk. Great infographic about the big data / analytics / data science / deep learning / BI ecosystem. Created by @Mattturk, @Jimrhao and @firstmarkcap. Click on the image to zoom in.